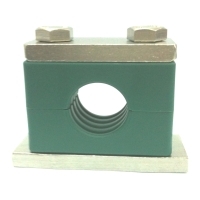 Having difficulties looking for Stauff Pipe Clamps? We can help you because we have all sizes. 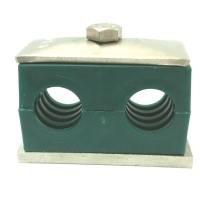 Stauff pipe clamps are made accordance with DIN 3015 standards. Stauff pipe clamps are used for quick and easy pipes and hoses installations. They are used to reduce the impact and vibration of fluid flow and provide strength in the direction of the tube axis. Pipe clamps are commonly known as pipe brackets, pvc clamps, pipe clamps, tube clamps, or just stauff clamps. 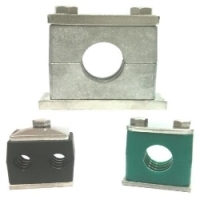 Stauff pipe clamps are typically available in three series: Standard, Heavy, and Twin. 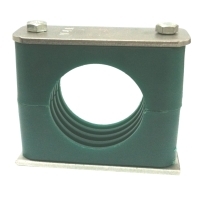 Common materials used for pipe clamps are polypropylene (PP), polyamide (PA), Aluminium (AL). Different configurations of pipe clamp are available to suit different requirements. Stauff clamps or pipe clamps are devices that used to grip and support mechanical and structural parts. 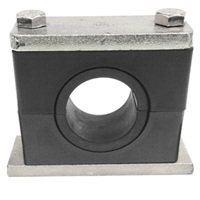 Pipe clamps are made in accordance to DIN 3015 standards. The purpose of using pipe clamps is to reduce the vibration and noise throughout the systems. Pipe clamps are usually used for tube, pipe, and hose installations in applications such as offshore, hydraulics, general industrial pipe construction, mining industry, nuclear reactor construction, instrumentation and control technology, and pneumatics. Typically, pipe clamps are supplied with four components which is clamp shell body, cover plate, weld plate, and hexagon head bolts. The most used materials for the clamp body are polypropylene, polyamide, and aluminium. There are different colours for different materials: green for polypropylene, black for polyamide, and silver for aluminium. The different colours help to differentiate which type of materials are being used. Other materials for clamp body are also available upon request. Different materials will lead to different temperature range. 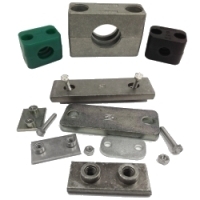 ​For the parts of pipe clamps such as cover plate, weld plate, and hexagon hex bolts, they are normally available in steel or stainless steel SS316. There are 3 main series of pipe clamp: standard series (STD), heavy series (HVY), and twin series (TWN). ​Table beside is showing the available size range for each series. Before deciding which clamp series is appropriate to use, we need to measure the external diameter of the tube, pipe or hose that are intending to have pipe clamps installed onto. There are 3 types reading measurement which is metric sizes, inches outer diameter sizes, and inches nominal bore sizes. By the measurements of tube, pipe or hose, an appropriate clamp series can then be recommended. Different types of assembly are available to suit different installation types. For any installation on weld plates, it is recommended to mark the location first for the alignment of weld plate. Then push on bottom half of clamp, install pipe, mount the top half of clamp together with cover plate and bolts. In order to avoid damaging the clamp body, it is recommended to weld the weld plates first before mount the clamp body. For pipe clamps installations, below table was a recommended distances between pipe clamps. It is to ensure that clamps are installed in a proper distances and perform well in reduce vibration and noise.